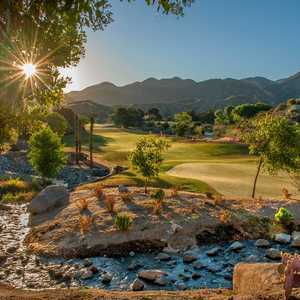 SANTA CLARITA, Calif. -- Ted Robinson Sr. has designed golf courses all over the world, but Robinson Ranch Golf Club in Canyon Country is unique. All designers seem to have their signature courses these days, but this one has Robinson's name on it. The 16th hole on the Valley Course at Robinson Ranch Golf Club is a sharp dogleg left. Robinson Sr. has designed nearly 200 courses, including Sahalee Country Club in Redmond, Wash., host of the 1998 PGA Championship; the Experience at Koele on the Hawaiian Island of Lanai; Pinx Country Club in Chejudo, South Korea, home of the Johnnie Walker Asian Nations Cup; Ko Olina Golf Club near Honolulu, and Tomoika Golf Club near Tokyo. Now Robinson and his son, Ted Jr., have given golfers in the Santa Clarita Valley, who had no championship course to play in the area after Valencia Country Club privatized in 1985, two spectacular courses that rank with the best in southern California. "You don't create something of this magnitude by yourself," Robinson Jr. said. "We want to thank all the people who took this journey with us and the staff that is here every day making it work. This is a project we can all be proud of for years to come and we're proud that this facility bears the Robinson name." 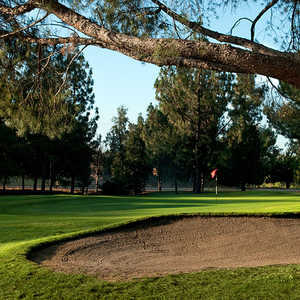 Robinson Ranch Golf Club, located about 10 miles from Six Flags Magic Mountain Amusement Park, was a Christmas present for local golfers when the Mountain Course opened in December of 1999, and the Valley Course opened for play on the following Memorial Day weekend. "I love it," said Duffy Waldorf, the PGA Tour pro who lives less than five minutes down the road from Robinson Ranch, which is located in the Sand Canyon area. "It's so secluded, it's like you're away from the world. I like the solitude and the views are just tremendous." "The course is in such good shape. It's not often the greens are so perfect on a new course. It usually takes time for them to mature. But these greens were great on the first day." Waldorf hit a ceremonial tee shot during Robinson Ranch's grand opening that carried to within 15 yards of the first green on the 373-yard opening hole of the Valley Course. The Robinson Ranch project has been in the works for years but the developers endured numerous delays because of environmental and water issues. In fact, the 1999 opening was delayed for several additional weeks because of an disagreement between Robinson Sr. and Santa Clarita Water. "Robinson Ranch is easily the best of the newer courses in the area," said Tim Hogarth of Northridge, the 1999 California Amateur champion and the 1996 United States Public Links champion. "The greens are just so good, so smooth. It's great to have a public golf course of this caliber in the area to play and not have to drive very far to play it." Rick Smith, head professional at Robinson Ranch Golf Club, knows a quality golf course when he sees it, having served as head pro at Industry Hills Golf Club near Los Angeles, which is rated as one of the top 25 public courses in the nation by Golf Digest, and Valencia Country Club. The opportunity to start from day one at Robinson Ranch Golf Club lured him from Valencia, which hosted the 1998 Nissan Open, won by Billy Mayfair in a dramatic playoff against Tiger Woods. "The reason I moved is that this was an opportunity to be affiliated with a great designer and another facility that is first class," Smith said. "Having been at Industry Hills and Valencia, I felt this was another stepping stone for me. This is one of those places that is going to be known in the industry as a great facility. When I took the job, I felt it was a step up for me." Robinson Ranch G.C. is located in the foothills of the Angeles National Forest and the views, especially from some of the elevated tees, are spectacular. Despite the elevation changes, the Mountain Course is more friendly to high handicappers because it is shorter at 6,508 yards, but it still presents its own set of challenges. The Mountain, which plays to a par of 71, opens with the only par five on the front nine, 532 yards from the back tees, but it can be reached in two because the second shot is downhill. The front nine gets challenging quickly, with the 402-yard third hole, rated third-toughest on the course, and the 398-yard fifth, which is rated No. 1. The drive on No. 3 must find the fairway because a large trap and a lake guard the right side, and a large oak tree looms on the left. The second shot must carry the lake, which bisects the fairway just over 100 yards from the green. No. 5 is made difficult by oaks which line the fairway all the way to the green. The back nine starts with a par four listed as 400 yards, but it can play much longer because it is uphill and usually plays into the wind. No. 11 is rated the second-toughest on the course, a dogleg right par four that measures 354 yards to a green that slopes drastically from back to front. The green is reachable because the last half of the hole is downhill, but the driving area is very narrow. The 13th hole is 546 yards downhill, with a narrow approach to an elevated green because of a hill on the right and an oak tree on the left. It is followed by a challenging 194-yard par three. The 484-yard par five finishing hole can be reached in two but anything short is in the lake fronting the green. The green slopes from back to front and you don't want to be above the hole. "When the guys from the Southern California Golf Association were out here rating the course, they commented that even though there is a degree of difficulty to the (Mountain) course, it's very player-friendly around the greens," Smith said. "And even though the course is a little hilly, it's more of a rolling terrain and you don't get a lot of goofy lies. The fairways are terraced and if your ball reaches the end of one, it usually rolls down onto a relatively flat area on the next one." The Valley Course is longer at 6,903 yards from the back tees and a bit more challenging because it is narrower and less forgiving for any shot hit off line. The Robinsons had very little earth moved in creating the course, which winds through scrub oak, sage, chaparral and oak trees, giving it a natural feel. If you can't see where your ball lands, it's probably lost. "It's a shot-maker's golf course," said Larry Atlas, assistant pro at Robinson Ranch. "You can't just take your driver and hit it as far as you can, even though there is some length from the back tees. You have to think your way around the golf course." The front nine of the Valley Course is challenging enough, but the game is not on until you leave the 12th green and are greeted by a sign that reads, "Welcome to Death Row." The 13th hole, the longest on either course, measures 596 yards from the back tees and your drive must carry through a chute of trees about 15 yards wide and 50 yards long. "It's like hitting down a hallway," Smith said. The 14th hole is an uphill par three that stretches to 248 yards from the back tees, and then come par fours that measure 414, 407 and 441 yards respectively. The 522-yard finishing hole is reachable in two because it plays downhill and often downwind, but if your second shot is a little right it's probably in the lake that guards the green. Like most Robinson courses, there is plenty of water to be found. "I think the 18th hole on the Valley Course is of magazine cover quality (with a waterfall cascading into the lake below the 25,000-square-foot Western-style clubhouse, which offers dramatic views of the course)," Smith said. "But it's a great finishing hole with plenty of risk and reward." "We expected the Valley Course would be a little more difficult and that's the way it's worked out. It probably has to do with the length of the back nine. That's reflected in our pace of play. It takes longer to play that nine, probably because people are looking for balls more often." "People prefer the Valley Course by about a 60-40 ratio. Most people playing here for the first time seem to want to play the tougher course. But the Mountain Course certainly has its share of fans." Where both courses are really fun is on the A-1 bent grass greens, which roll straight and true. Golf magazine rated the greens as the best in southern California. The putting surfaces are fast, seemingly a bit more so on the Valley Course, but the breaks are subtle rather than severe. You have to be careful putting on the Valley but on the Mountain Course, the ball seems to settle near the hole rather than running away. "Most of the greens aren't this good, or as fast as the Valley Course, on the PGA Tour," Waldorf said. "They had new greens at the Memorial and the Colonial tournaments last year that were as good as Robinson Ranch, but they are the same type of grass. And Augusta's greens are awfully good, and maybe faster, but that's about it." When the PGA Seniors played at Valencia this year, a Super Seniors Pro-Am was held at Robinson Ranch. Bob Charles, Gibby Gilbert and Terry Dill were among the pros who raved about Robinson Ranch, especially the greens. "I wish we could take these greens back over (to Valencia)," Gilbert told Smith. Fans of the Robinson golf courses will find two others of note in the valleys north of Los Angeles: Wood Ranch in Simi Valley, which has hosted the Senior PGA Tour and the LPGA Tour, and North Ranch Country Club in Westlake Village, where Steve Pate of the PGA Tour lives and has held his annual charity tournament. Robinson has designed dozens of other California courses, including the Golf Resort at Indian Wells in the Palm Springs area; scenic Snowcreek Golf Club in Mammoth Lakes at the foot of Mammoth Mountain Ski Resort; the North Course at Rancho Murieta Golf Club, which has hosted the Senior PGA Tour and is considered the best course in the Sacramento area by California Golf; Tijeras Creek Golf Club in Rancho Santa Margarita, rated as one of the best public courses in Orange County; and Blacklake Golf Resort in Nipomo, a gem on the Central Coast. According to the Robinson Ranch website, Ted Robinson Sr. considers Robinson Ranch his best work yet. "You could hold any type of major amateur tournament, like the Southern California Amateur or even a U.S. Amateur (at Robinson Ranch)," Waldorf said. "And I would say it's good enough for a PGA Tour event, too." For the locals, just a weekly game is enough.